Drill NOT included. 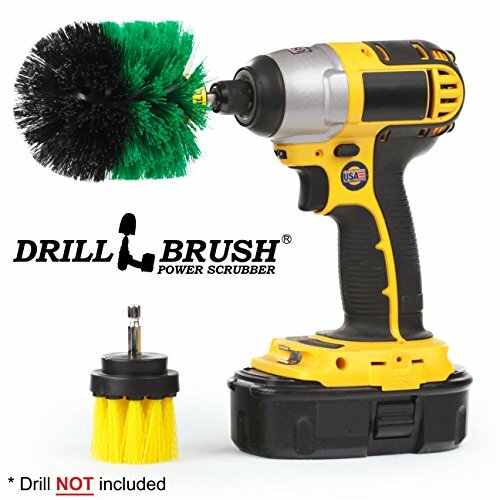 Two piece kitchen, bathroom, and tile cleaning brush kit includes: The Drillbrush Power Scrubber in black and green. Medium stiffness Polypropylene Bristle cordless drill powered cleaning and scrubbing brush. Works great on Tile and Grout, baseboards, carpet, upholstery and general purpose scrubbing. Green and black version of our all time best selling brush to scrub and clean contoured surfaces. Medium bristle stiffness for all purpose cleaning and scrubbing. Use this all purpose power scrubbing brush around the house and in the bath and kitchen. These brushes fits securely in battery powered drills and impact drivers. Great for hard water stains, soap scum, tile and grout, hard to reach areas. Perfect for getting behind fixtures, faucets and kitchen areas. Guaranteed quality. Drill is NOT included.